Ballymena United under 15's who defeated Bertie Peacocks on Saturday. Ballymena United under-15s shook off a couple of weeks’ inactivity with a sprakling display on their return to action at the weekend. The 15s’ comprehensive 5-0 win at Bertie Peacock Youth in the League Plate was the pick of the BUYA performances over the weekend. The 13s also progressed in the league plate with a derby win over Coleraine but the 12s put in their most disappointing performance of the season as they were hammered at home by Crumlin in the NIBFA cup, while the 14’s lost out narrowly in a six goal thriller against league pacesetters Cliftonville. The success up the club in the youth ranks continues,the under 16’s defeated Magherafelt Sky Blues while the 17’s roared into the latter stages of the league cup with a brilliant 6-4 win away to Dungannon. BUYA 0, Crumlin Star 6: A disappointing United were outmuscled by a streetwise and determined Crumlin side who were too strong for the Braid boys on the day. BUYA 3, Coleraine 1: The home side took the lead when Ross McCausland finished with composure in the first half. 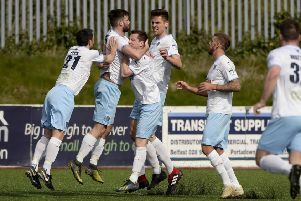 With the wind in their backs in the second half, United dominated and Lewis Mearns bounded clear to score twice before Coleraine pulled a late goal back. BUYA 2, Cliftonville 4: Having gone behind on 20 minutes, United equalised when Thomas Mayne’s shot was parried by the keeper to Sean McKay, who slammed home. Two goals for Cliftonville early in the second half looked to take the game away from Ballymena before McKay lashed home a 25-yard strike. A late gola put the outcome beyond United but they can be pleased with their display. Bertie Peacock Youth 0, BUYA 5: United were straight out of the blocks, Andrew Smith firing home with a tidy volley after all of 40 seconds. The Skies doubled their lead after some nifty footwork on the right, Jack Millar set up Stephen McColgan and United’s top scorer made no mistake hammering home. Ethan McKeown was showing some deft touches in the middle of the park and headed home with a lovely effort to make it three. Into the second period and with a strong display from the impressive Adam Neilly at the back, United looked secure. McKeown showed great skill, dragging a ball back inside on the edge of the box before rifling into the top corner, before the bustling Smith raced away for his second as United enjoyed themselves.